The second quarter of the year contained plenty of action for market watchers. Trade war rhetoric and threats involving North Korea marred the first quarter and challenged the early innings of the second quarter. Following that, a relative calm settled in allowing US stocks to drift higher for a few weeks. However, that ended when tariff threats and geopolitical risks picked up again late in the quarter. Oil prices have continued to move higher (now over $73 per barrel vs. $45 a year ago), stoking fears of stronger inflation to come. Interest rates began to move higher in anticipation that the Federal Reserve would need to hike rates faster to combat rising inflation. The Fed did end up raising rates at the June meeting (as widely anticipated) – for the second time this year and the seventh time since they took rates to near-zero in December 2008. The “dot plot” communique following that meeting signaled the potential for four total rate hikes in 2018, one higher than what was projected in the March meeting. With US interest rates rising, international interest rates holding steady, and trade tensions escalating, the US dollar began to move higher. Trade disagreements began to manifest in global manufacturing surveys, with new orders slowing, input costs rising, and supply chain delays worsening in most markets around the world. Still, all of the economic indicators are still pointing at growth – just slightly lower growth than before. Despite all of the machinations throughout Q2, US markets managed to finish higher. Large cap US stocks (e.g. the S&P 500) were +3.4% for the quarter on a total return basis (including dividends). Mid-sized and smaller US companies, which tend to be less exposed to international trade, ended the quarter +4.3% and +7.8%, respectively. International markets didn’t fare as well, with developed markets (MSCI EAFE) -1.0% and emerging markets (MSCI EM) -7.9% for the quarter. Interest rates were erratic, (initially moving much higher, then giving up most of that gain over seven days at the end of May), but ended only slightly higher than where they began the quarter. This put modest pressure on the total performance of most bond categories. The benchmark Bloomberg Barclays US Aggregate Bond Index ended the quarter -0.2%, but high yield bonds managed to post a positive figure at +1.0%. Emerging market debt was -2.4%, hurt by dollar strength. In periods of change, markets tend to get a little choppier – and that’s what we’ve seen so far this year. 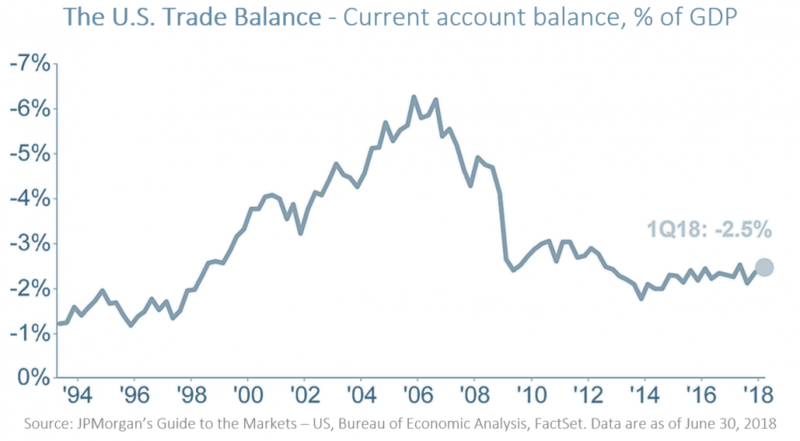 Trade tensions are a relatively new wrinkle, and they are keeping a lid on the growth potential of the global economy and hurting international markets. However, there are plenty of good things happening beneath the choppy surface. During the quarter President Trump and Kim Jong-un de-escalated their feud, consumer sentiment figures continue to trend higher, corporate earnings remain strong, and valuations remain fair. In the absence of trade war threats, these positives are pushing markets higher. We encourage investors to stay focused on the economic fundamentals, which remain positive. As always, filtering the noise, staying disciplined, and taking advantage of rebalancing opportunities is paramount to achieving better long-term investment outcomes.